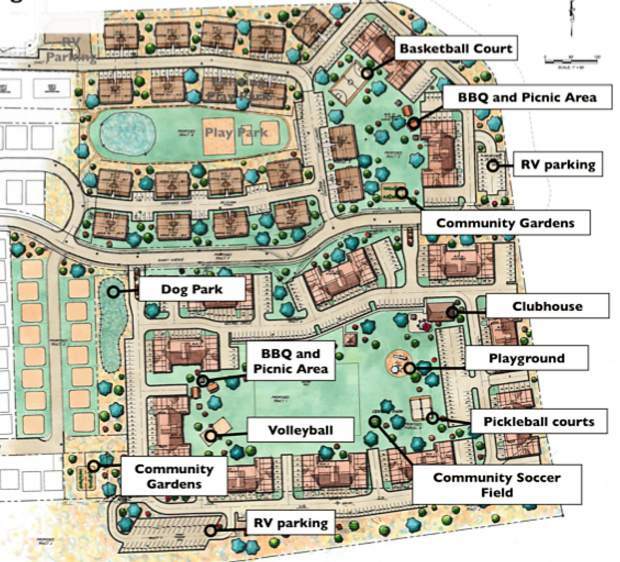 The layout for the Spring Creek Village project features 12 large apartment buildings, several townhome lots, 15 single family homes and a number of site ammenities including pickleball courts, a dog park and more. GYPSUM — Last week marked a big milestone for the proposed Spring Creek Village project in Gypsum. Gerry Flynn, of Polar Star Development, said after months of the company working on its financing package, the company closed on the former Stratton Flats property located on the eastern side of Gypsum, south of U.S. Highway 6. 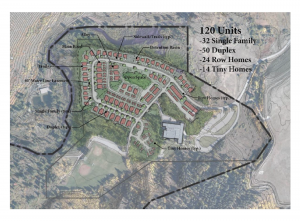 At the same closing, held Thursday, Oct. 25, the company sold one section of land to a local builder who will construct single family homes at the site and another section to Habitat for Humanity Vail Valley that plans construction of 36 townhomes. The centerpiece of Spring Creek Village is the plan for 282 apartments in 12 condo buildings. The apartment complex will be a mix of open market and income-restricted units. Flynn noted Polar Star Properties has had the Spring Creek Village site under contract since December 2016. In January of this year, the town of Gypsum approved the plan for Spring Creek Village. Since then, Flynn said his company has doggedly worked to put together the land purchase and construction financing deals for the project. While the land purchase deal has been concluded, the project’s construction financing isn’t slated to close until January. “It took so long because we were putting together a tax credit financing,” he said. The tax credit financing ties to the income restricted units at Spring Creek Village. Those units will be reserved for renters who earn no more than 60 percent of the Eagle County median family income. The median family income in Eagle County is around $90,000 so the median family income limit for Spring Creek Village will be approximately $60,000. Rental prices for the income-restricted units will be approximately $900 per month for one-bedroom units and approximately $1,250 per month for three-bedroom units. “That is considerably lower than prevailing rents around the valley,” Flynn said. The six buildings that will feature income restricted units will be the first phase at Spring Creek Village, and Flynn said once the construction financing deal is completed, the company will begin work as soon as weather permits. “We will begin pre-leasing within six months of our construction start,” Flynn said. Along with the apartment units, he noted Spring Creek Village plan includes two playgrounds, a soccer field, a basketball court, community gardens, pickleball courts, a dog park, volleyball courts, trails, barbecue and picnic areas and a clubhouse facility. While Polar Star is focused on the apartment complex part of the Spring Creek Village plan, it has partnered with other builders to complete the project. Builder Rick Patriacca will construct 15 single family homes, adjacent to the existing Stratton Flats neighborhood. These homes were a key part of the debate concerning Spring Creek Village when it came before the Gypsum Town Council. The town rejected an initial proposal for Spring Creek Village when residents of the existing homes at Stratton Flats protested that they had bought into a plan that exclusively featured for-sale housing. The single-family home component was added to the plan and completes Stratton Circle by looping back to Sunny Avenue, the main entry road to the development. Moving to the east from the single-family home neighborhood, the Spring Creek Village plan now features a dog park and community garden area transitioning into the multifamily buildings and the various amenities planned for the project. On the southern end of the project, Habitat for Humanity Vail Valley has purchased 36 townhome sites. This part of the project is adjacent to the existing Habitat neighborhood. “They think that is where they will be building for the next five to six years,” Flynn said. He noted the project has an additional 40 townhome sites remaining and Polar Star will either sell off that land or build units themselves. “But right now, our focus is the 282 apartment units,” Flynn said. With the land closing now complete, Flynn thanked both Patriacca and Habitat for their dedication to the project. “They hung with us for about a year and we could not have signed the contracts without them,” he said. Likewise, Flynn thanked the town of Gypsum for its efforts to bring Spring Creek Village forward and to Eagle County for approving a $500,000 low interest loan through its affordable housing program to assist with the tax credit financing.